If you're a web designer, you probably know that FontAwesome is, well, awesome. Alas, in 2016 it is probably the most overused design asset on the web. The best way to stand out in a sea of font awesome apps is to build your own icons from scratch. But don’t just build it for yourself, open source it for the rest of the world to use. We are going to start the lesson by teaching you how to draw your own SVG-based icon font from scratch using Adobe Illustrator (or any other drawing program, like Sketch). Next, we are going convert the icons into font that is mapped to CSS classes. Finally, we are going to use Bower to create a NPM package that can easily be integrated into other apps using open-source technology. We shall call it FontAmazing. When developing an icon font, there are several best practices you should follow to avoid problems when mapping the images to a font. Let’s just list these out. Create a separate square artboard for each graphic, 64 x 64px is a good workable size. The final image must be 1 color as a solid fill. No strokes! Before exporting to SVG, you will need to click object >> expand appearance if you your graphic has any strokes. Make sure the image doesn’t have any paths that extend beyond the artboard. Convert text objects to outlines, then merge them to the icon. Our icon font is just going to have just 3 SVG graphics. 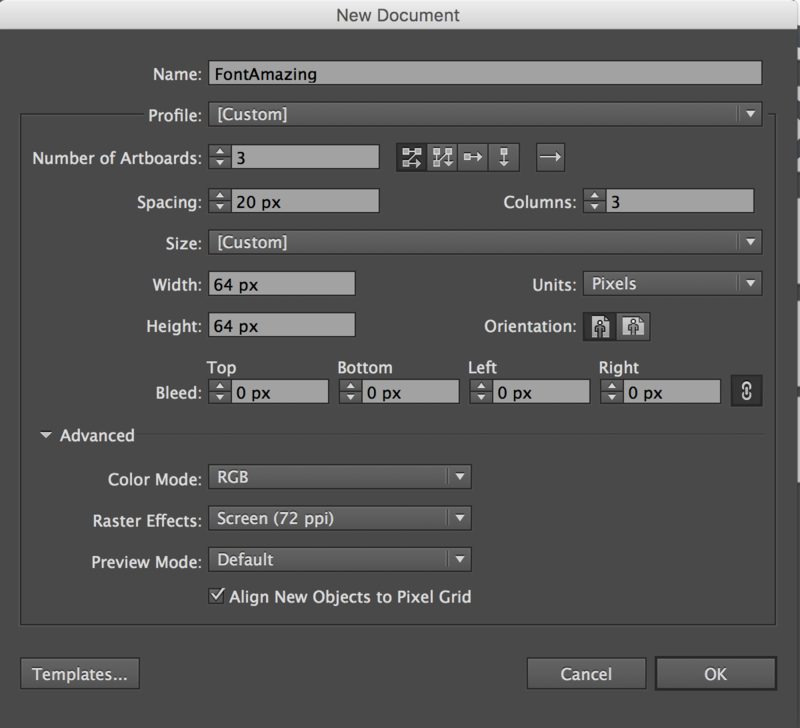 Create a new illustrator file and configure it to use 3 artboards, each 64 by 64. That should give us 3 artboards to work with. First were going to create a simple user icon. Use the ellipse tool to draw a couple of circles the somewhat resemble a human. Next, we need to merge these overlapping shapes into a single path. Having multiple overlapping shapes will cause problems if we try to map this to a font. Use effects >> pathfinder >> merge to combine the two shapes into a single shape. You can also hit Shift+M to use the shape builder tool if you so choose. Always try to create single objects when creating icons - you never want to have stray text or strokes in your artwork. Go ahead and create two more icons using the same process. Now we have 3 icons that can be exported to individual SVG files. Whe can achieve this in one fell swoop by going to file >> export (making sure to select SVG format and check use artboards). That should give us 3 different SVG icons that will be mapped to a font in the next step. That concludes the drawing section of the lesson. Now its time to turn these icons into an open source font family. Now we need to map our icons to a common font format, such as .woff, .ttf, .eot, or .woff2. There are several tools that make this process super easy. Check out Glyphter, Icomoon, and Fontastic to see which one is going to work best for you. They are all capable of doing what we need for this section of the lesson. Note: Icomoon is the only tool at this point that supports .woff2, which is the most optimized web font available, but its only available to premium members. 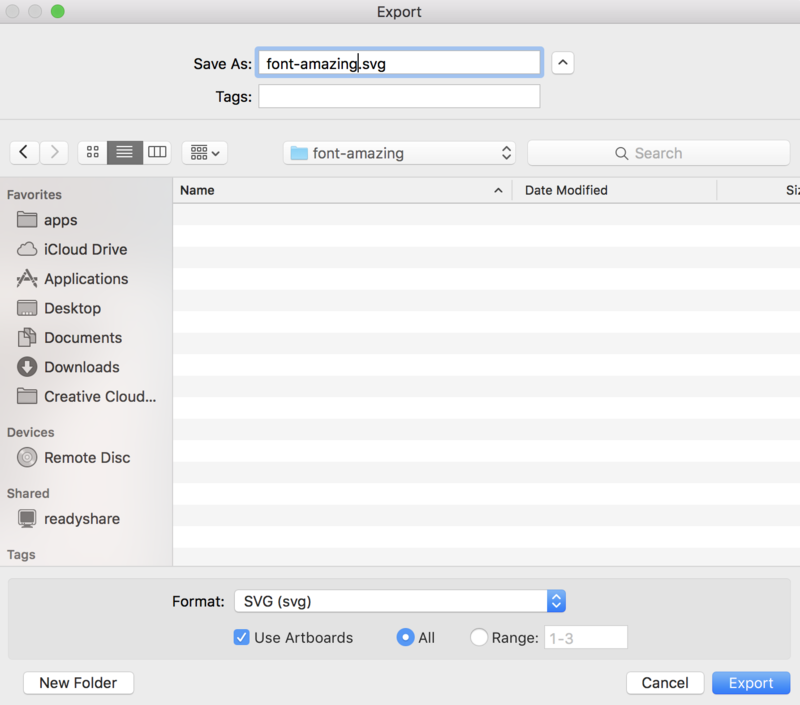 What is a font file, exactly? Fonts on the web are generally of the OpenType flavor, which is just a set of scalable digital shapes organized into a table. When we create our icon CSS, we will point each class to spot on this table that holds the appropiate icon. The apps in this section will help us build this table, or font file. We are going to use Glyphter. It’s free, easy to use, and built on ExpressJS. Simply drag and drop the icons into place, add it spits out our fonts and maps them to a CSS file. It also supports basic editing, which comes in really handy for certain types of icons. If you have arrow icons, you might need to rotate them in 8 different directions, which is a breeze with Glyphter. Just click export and you're done. Not much else to explain here. Glyphter gives us a basic CSS class that will make our icon font work at this point, but it would be nice to have the more robust CSS toolkit like that of FontAwesome for changing sizes, spinning animations, etc. In order to add some of this functionality, we are going to create a new CSS file from scratch. So now we can just chain these extra classes together to modify the look of our font. For example, the icon-2x class will double the size of the icon. If you're familiar with font awesome, the .fa class is the equivlent to .icon class in this example. Check out the Font Awesome github repo for all the modifier classes that can be used with your icons. Now that you have made an amazing icon font, its time to share it with the open source community. We are going to package our font with Bower, which will allow other developers to easily use our font in their projects. Next, create a directory for your font, initialize git, and initialize Bower. Bower is going to ask a few questions about the project. This is going to generate a JSON file with key information about your project. It is critical that this file is properly formatted before making your project publicly available. Lastly, you will need to register your package. There are a few rules you need to follow, so make sure to check out the bower registration guidelines. That’s it! You’ve created your own open-source icon font that will make the web a more interesting place.